The portable oxygen concentrators are tools that can completely replace the oxygen cylinders: being self-production systems require no filling or topping up and allow you to move freely with unlimited autonomy. In addition, the portable oxygen concentrators weigh much less portable strollers and are therefore more easily tolerated by those patients who have difficulty in supporting weight on his shoulders. 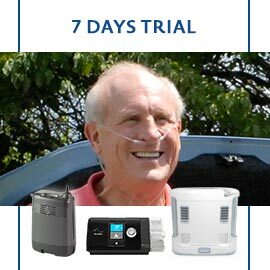 The stationary oxygen concentrators are tools able to self-produce oxygen without the need for charging or filling. These devices are able to ensure the same flow of oxygen of the cylinders with only the domestic power supply. Thanks to the wheels can be easily moved around the home and can be used with cannulas 8-10 mt to be able to move freely. Accessories and spare parts for all portable/transportable oxygen concentrators on the market: Inogen, Invacare, Devilbiss, Airsep, Sequal, Respironics, LifeChoice and Precision Medical. Accessories and spare parts for all of stationary oxygen concentrators on the market: Respironics, Nidek, Devilbiss, Invacare, Sequal, Airsep, Inogen and Kröber.